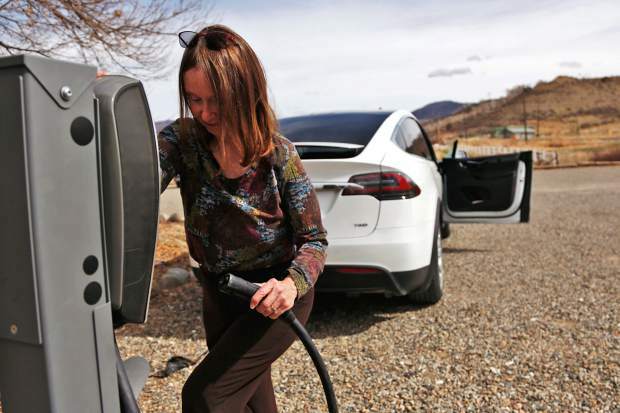 Penny Heuscher re-mounts a plug at an electric charging station in Paonia, Colorado. For Heuscher, “range anxiety” is nonexistent because there’s plenty of Tesla charging infrastructure available, her Model X has a range of almost 300 miles and the GPS system she uses helps plan trips depending on the amount of charge left in her car. As part of the national Volkswagen Diesel Emissions Settlement, the state of Colorado will receive $68.7 million from the environmental mitigation trust. Funds may be used to incentivize the purchase of low-emission vehicles and transit and for development of zero-emission vehicle fueling and charging infrastructure. Colorado Department of Public Health and Environment serves as the lead agency in administering Colorado’s allocation and has coordinated with the Colorado Department of Transportation and other agencies in drafting the state’s Beneficiary Mitigation Plan. Colorado’s plan proposes that 15 percent, the maximum percentage allowed under the terms of the settlement, be allocated for light duty electric vehicle charging stations. The funding will be available for both community-based and electric vehicle fast-charging corridor stations. The national settlement also requires that Volkswagen invest $2 billion over 10 years in zero-emission vehicle infrastructure and education programs. Electrify America, a newly created subsidiary of Volkswagen, will administer this investment. Funds will be spent in $500 million increments over four 30-month cycles. In the first cycle, Electrify America will focus on building a long-distance network of fast-charging stations along high-traffic corridors across the country. In Colorado, stations will be built along Interstates 70, 25 and 76. He was in the final stretch of what normally would have been a four-hour jaunt from Denver to Paonia, in the western part of the state. With charging stops, it ended up being a two-day trip. His car packed with bikes and clothing, he spent the last few hours charging the battery in his electric vehicle in Carbondale. As he climbed, the remaining range on his charge dropped from 70 miles to 40 to 30. “I was just panicking,” Espinosa recalled in a recent interview with High Country News. The fear Espinosa experienced that day has a name: “range anxiety.” And it has hindered electric-vehicle adoption in the interior West, where cities and charging stations can be hundreds of miles apart. This is a serious obstacle, since electric cars have the potential to improve air quality, meet clean-energy goals and promote tourism. That’s why Western states are determined to follow the West Coast’s example and build the infrastructure needed to attract more converts. In October, governors from Arizona, Colorado, Idaho, Montana, Nevada, New Mexico, Utah and Wyoming signed an agreement to add high-speed charging stations to every major interstate in the region. Christian Williss, director of transportation fuels and technology at the Colorado Energy Office, said his state aims to make charging “as quick and convenient” as gassing up. It’s up to each state to figure out its individual infrastructure plans. Colorado released its own plans in January, which include installing signage so that both electric vehicle and non-electric vehicle drivers become familiar with charging locations and building out fast-charging corridors. In the initial phase of development, between 30 and 35 fast-charging stations will be built out, spaced approximately 50 miles apart along the state’s major interstates and highways. “We want to give people the confidence that if they buy an electric vehicle, they can go anywhere they want to,” Williss said. For charging deserts such as Wyoming and Montana — which lack fast public stations — the agreement represents their first major push to create electric corridors. Tesla does have “superchargers” in both states, but they’re proprietary; only Tesla drivers can use them. And without other public stations handy, even Tesla owners can suffer range anxiety on the mountain states’ wide-open highways. In Montana, where electric vehicle adoption has been slower, infrastructure is seen as necessary for tourists. Chris Calwell, an electric vehicle driver from Durango, said taking his Tesla on road trips sometimes dictated where he could and could not go and forced him to take long layovers to recharge. By adding charging stations, Montana hopes to encourage more drivers like him to visit. In some places, though, rural communities are already filling the gaps in the charging landscape. They’ve figured out that getting electric vehicle drivers to stop to recharge can be good for the local economy, luring travelers into shops and restaurants while they wait. Lima, Montana, with a population of just more than 200, has eight Tesla stations, for instance. Situated between Glacier National Park and Salt Lake City, it’s a convenient waypoint for travelers. Calwell thinks that in a few years, all this hubbub about charging stations and electric car adoption will be a distant memory. This story was originally published at High Country News (hcn.org) on March 20, 2018.